Village Signs (VS) is a series of caches based on the ornate signs that depict the heritage, history and culture of the villages that put them up (normally on the village green!). The village of Andoversford is located about 6 mile east of Cheltenham. The village runs parallel to the A40 which before the construction of the curved bypass ran through the village. 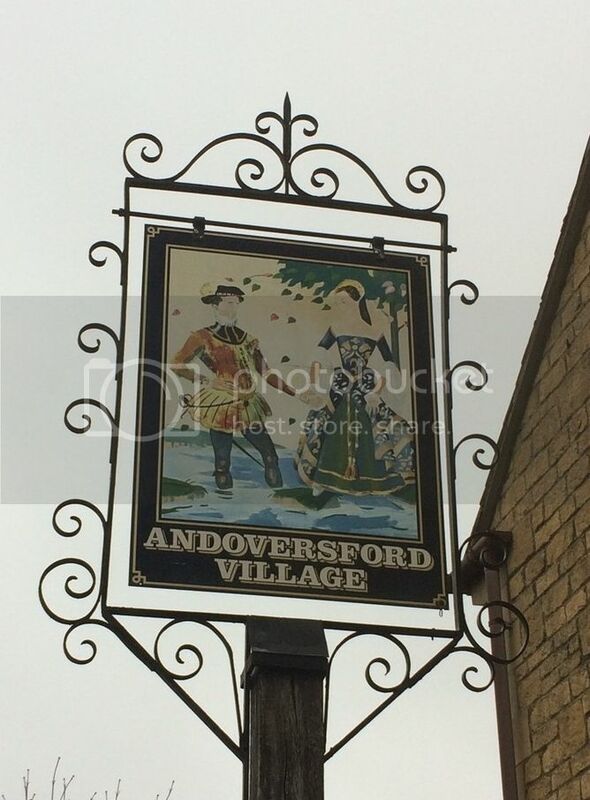 Andoversford's village sign is housed on the old pub and hotel sign for the long since demolished Andoversford Hotel the site of which is now the Huntsmans Meet housing that you see behind the sign. There maybe sheep and horses near GZ at certain times of the year please be aware of this and cache responsibly near animals. There is a sign warning of a Bull please bare this in mind it should be with other cows . I ADVISE NOT TO TAKE DOGS WITH YOU FOR THIS CACHE. At the headline co-ordinates you will find two objects a bench and a stone drinking trough now used as a flower bed.